Peel potatoes and slice into large chunks 1″ thick and 2″ in diameter and set aside. Chop onions and set aside. Heat the oil in a large pot over moderate heat. Add the onions and sauté until slightly softened. Add a generous dash of salt and 2 tablespoons curry powder, and stir until fragrant, about 10 seconds. Add the chicken and cook until the edges of the pieces are golden, 3 to 4 minutes. Add the sweet potatoes and coconut milk and cook on low heat for 2 hours with the lid on. Make sure the chicken and potatoes are submerged under the coconut milk. After 2 hours, salt to taste if necessary and serve with rice. 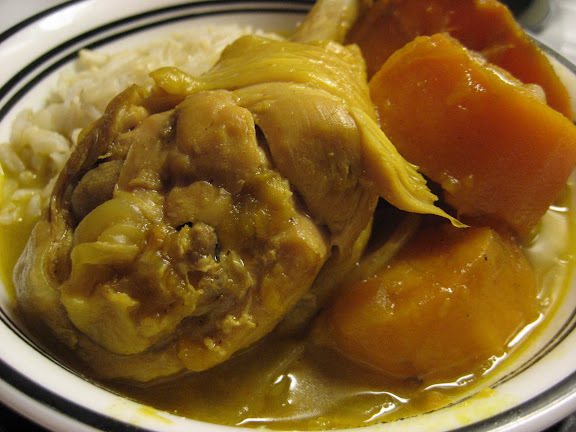 Cook’s note: My grandma uses various chicken parts in her curry, but since everyone always prefers the drumsticks my version only uses drumsticks. She also adds regular white potatoes along with the sweet potatoes. Oooh.. try duck next time too! duck and white sweet potatoes. check and check. thanks for the tasty suggestions! Amy – I would add water or chicken broth as well to lighten up the broth to taste. Madras curry powder and ca ri an do are the same thing. “An do” means India and “ca ri” means curry. Enjoy!